Everything you need to know about visiting Times Square (Broadway between 42nd and 47th Sts, New York, 10036). Is there a more iconic spot in all of New York City—nay, all of America? We think not! The bright lights, the suffocating crowds, the honking horns and the bright, LED billboards all make for a hypnotic experience. While many New Yorkers will scoff at the popular tourist destination, even they are not always immune to its wonders. Here, you’ll find people from every corner of the world, from high-powered businesswomen in $10,000 suits to a cowboy who is basically in his birthday suit. Complain about it all you want, but also embrace it: This crossroads and its surrounding neighborhood are pretty damn magnificent. If ever you find yourself hating on Times Square, remember just how remarkable a place it really is. Since gaining its nickname back in 1904, the area has been reinvented many times over, with skyscrapers and new mega-stores changing the layout of the land. Yes, it has become a bit of a Disney-like theme park of New York, but would you really want to return to the ‘70s or ‘80s when seedy adult-only stores were everywhere you looked and crime was high? 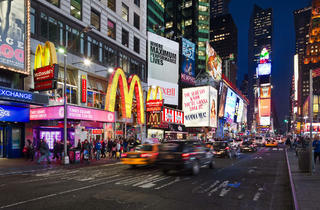 Take a walking tour with Times Square Alliance, and you’ll be amazed by how many secrets this pocket of the city holds. On any given day, there are always going to be tens of thousands of people herding down the street. But if you want to avoid being completely crushed by the masses, we have a few tips. One: Don’t try walking through between 5pm and 8pm–this is when the folks leaving work converge with hungry tourists and pre-theatergoers. In other words: Mayhem. Two: Stay away most summer days. That’s when natives try to get out of town and tourists flock to the area, and while it’s not quite as busy as the holiday season, the heat of the summer drives people insane. Three: Beware anytime between mid-November and the beginning of January. Christmas brings everyone to see the lights, windows and more. If you absolutely must visit at this time, try to go late at night, or at least leave plenty of extra time to get between destinations on foot. 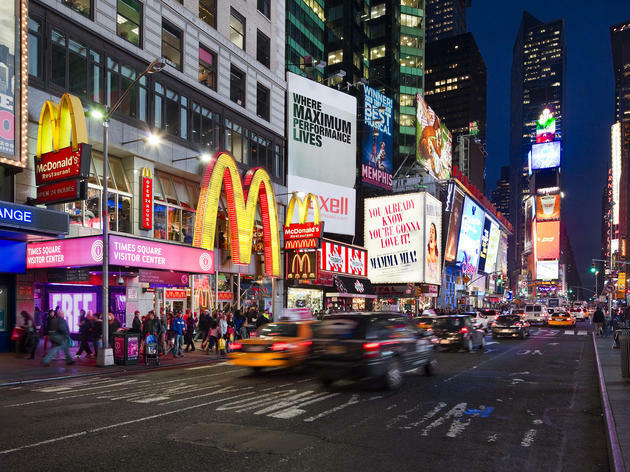 Whether you’re only in town for the weekend or you’ve lived here forever and you’re trying to please some out-of-town visitors, get the most of your afternoon in Times Square. We know it’s goofy, but go ahead and take pictures with wax versions of your favorite celebrities at Madame Tussauds or pour yourself a massive bag of M&M’s at the flagship store dedicated to that tiny, delicious chocolate candy. Then cap the day off with a cocktail at one of the great (if a bit pricey) theater district bars like Rum House or Bar 21. Our New York editorial team is constantly updating and reviewing the best attractions, activities and venues across the city, so that you're always in the know, with the best of NYC. at your fingertips. Times Square was most recently updated with new tips on June 30, 2017. Intersection of media, commerce, transport hubs, and shady businesses and grifters. Lots of overpriced chain hotels, fast food spots, and franchises. Large ads, billboards, banners and displays around the plaza, and more pedestrian walkways - difficult to actually catch a cab. Stays open all night. Have added some art installations, and more security - still tend to stay towards lit areas late at night. This place is so iconic of New York City with all those lights and advertisements. Also it’s in this neighborhood that you can attend to all Broadway musical comedies’. I don’t really liked it because it’s so crowded and there is many people that annoy you because you’re a tourist. There is also some touristic shops. It’s not authentic enough for me. So, I'll admit, I'm not a huge fan of Times Square. It's crowded, loud, and hectic. People here don't really adhere to social norms, and will do anything from randomly stopping in the middle of the sidewalk to talking really, really loud on their cells. On top of annoying tourists who seem to have all the time in the world based on their barely crawling speeds, you're also constantly bombarded by people selling their mix tapes, people trying to get you to see a "free" comedy show, and people dressed up in Disney/Marvel costumes asking if you'd want a picture. And as if all of the above wasn't bad enough, you're also in tourist trap central, which means there's a dearth of good food/bars around you. Everything is overpriced, and the quality just isn't great. However, all that being said, witnessing Times Square for the first time, especially at night, is truly a breathtaking sight to behold. Here's how I feel about Times Square: If you've never been there, it should certainly be on your list of stops. It's one of the most photographed spots in the world and all those advertisements vying for your attention truly are mesmerizing. And after you've had your stop, immediately leave. It is constantly packed with tourists and just people in general, any food or drink in the area is found at exorbitantly overpriced chain restaurants or dinosaur restaurants that can charge whatever they want, and you really don't need anything you'll find in the stores nearby (no, you don't need M&M's with your face printed on them). Want fun New York touristy items? Hit the Bowery and leave this forsaken place behind.